From left, Carrie Mae Weems ’84 and UC San Diego Black Studies Project associate director Sara Clarke Kaplan. 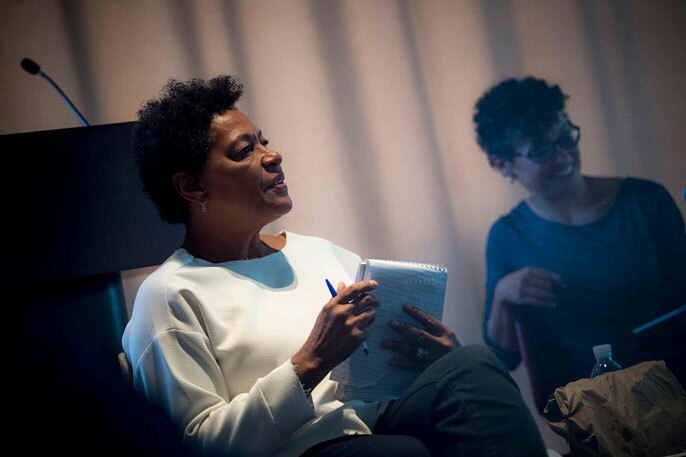 UC San Diego welcomed the return of celebrated artist Carrie Mae Weems Nov. 6-7, a distinguished alum who received her MFA from the Department of Visual Arts in 1984. Considered one of the most influential contemporary artists, Weems encouraged curiosity, finding purpose and deep engagement. Weems met with Black Studies Project students over lunch on Nov. 6. Weems — whose last public appearance at UC San Diego was in 2015 — also sat in small, private conversation with students across campus. She was inquisitive, spending less time discussing her own practice and more time listening to the concerns and research of undergraduate and graduate students from the Department of Visual Arts, as well as students in the university’s Black Studies Project. Weems said exploring these questions does not come quickly nor easily, but the university can be an “enormous resource” where students find purpose and meaning. She encouraged them to ask how they could use the system to get what they needed while here. From left, Department of Visual Arts graduate students Nico King, Fabiola Carranza, Kevin Vincent, Tanner Gilliand-Swetland and Dana Washington in conversation with Weems. A 2017 UC San Diego Outstanding Alumni honoree, Weems has received numerous awards, grants and fellowships throughout her career, including the prestigious Rome Prize, National Endowment of the Arts award and, in 2013, a MacArthur “Genius” Fellowship. She has been recognized for her commitment to the Department of State’s Art in Embassies program, and received the Congressional Black Caucus Foundation’s Lifetime Achievement Award, a BET Honors award for visual arts and a Lucie Award for fine art photography, among many others. She was one of four artists honored at the Guggenheim’s 2014 International Gala. Weems has investigated family relationships, cultural identity, sexism, class, political systems and the consequences of power. For more than 30 years, she has developed a complex body of art employing photographs, text, fabric, audio, digital images, installation and video, and said she has many curiosities about collaboration, art and art practice. Weems (center) with students and faculty members on Nov. 6. While Weems said she rarely reads reviews of her work, she is deeply determined to be engaged and keenly aware of her place in the canon, not only as an artist, but as a black, woman artist, too. Multiple students asked about ethnic and cultural representation in both her art practice and their own. Weems’ visit anchors a dynamic lineup of guests from the Department of Visual Arts meant to engage and inspire an active student population and artistic community on campus, as well as to broaden the scope, appeal and range of art throughout greater San Diego.